A clear agenda is a must for any meeting. Use and adapt this template to create an agenda for any meeting. Include the goal of the meeting. Get your meeting attendees in the right frame of mind by setting and clearly communicating what you intend to get out of the meeting. What do you want to discuss? What results do you need from that discussion? Why is this specific group of people present? List out your talking points. Once you know why you’re hosting your meeting, you’ll be able to better fill in the points you need to cover. List them out, or invite attendees to collaborate on your agenda and add items of their own. Assign talking points to attendees. Even though you might be leading the meeting, you might want to have others cover certain talking points. Identify who will be talking about what, and give them a heads up in case they need to prepare. Share it with attendees in advance. Before your meeting, share your agenda with attendees so they know what you plan to discuss and, once the meeting begins, you all can jump right into resources. Also consider where you’re hosting your meeting agenda. By housing it in a collaborative project management tool, such as Asana, you can invite teammates to view and add to meeting agendas in advance and add action items to follow up on later. 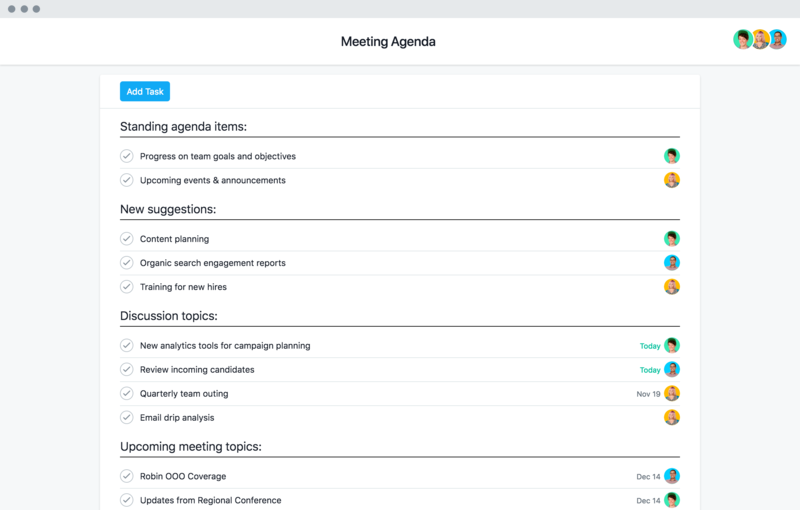 Get started with Asana’s meeting agenda template today. Leading a meeting? Do it confidently in five steps. Bad meetings happen to great teams. Avoid top pitfalls with these simple tips. Turn your template into an active agenda and best practices for effective meetings with this course. Teams that plan their meetings with Asana Premium save time and keep track of important details. See for yourself with a free trial.